With some declaring that gender is over, there’s no individual more suited to lead the charge than British artist, Genesis P-Orridge. Essentially the founder of Pandrogeny, Genesis prefers to be referenced as “they”, and will be henceforth in the following words. Something of a cult hero, they started out as Neil Andrew Megson in Manchester, UK. Young Neil (now Genesis) had a keen interest in the occult and soon found themselves dropping out of university, changing their name to join a commune in London, and adopting their current moniker. Eventually they found themselves in cahoots with some fellow avant-garde artists and developed early Industrial music pioneers Throbbing Gristle. 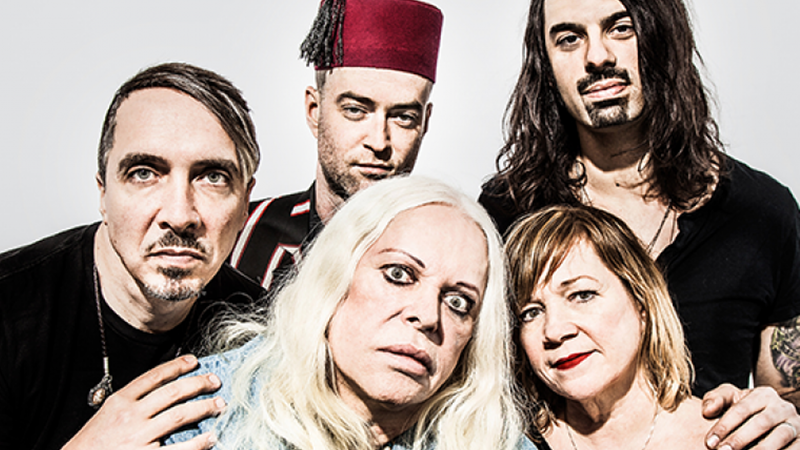 From the ashes of Throbbing Gristle, Genesis P-Orridge formed Psychic TV in the early 1980s, an experimental rock band that has slowly morphed over the years into an acid house Trojan horse, willing to sneak through the gates and inform us all of our Otherness. Genesis eventually moved to New York City in the early '90s where they met the love of their lives in Lady Jaye, (born Jacqueline Breyer). They married, and over time, Genesis and Jacqueline became closer by augmenting their bodies to remove the barriers of self in an effort to become one—and the Pandrogeny (Project) was born. Watch that documentary, bring some tissues and then come right back… You with us? Good. Past the heartache and healing Genesis refocused, speaking out about their art, re-forming Throbbing Gristle briefly, and continuing on with Psychic TV. Released September 16, Psychic TV’s newest album, Alienist, celebrates being “alien”-slash-the Other. As Genesis declared during Psychic TV’s performance at Music Hall of Williamsburg, "pretty soon we’ll all be aliens." TONIGHT!! Music Hall of Williamsburg. The live band continues its exploration of acid house during their set, replete with the most trippy of visuals moving behind them in real-reactive time with the band’s music and lyrics. The psychedelic journey continued with Genesis chanting out about failed rebellions, forgiving Satan and (cheekily?) inviting him to come back home, all whilst wearing the new Psychic TV tie-dye T-shirt, a lantern fashioned to Genesis’ head. At one point the audience’s applause wasn’t ecstatic enough for Genesis and they chastised the lot of us, claiming they could be home on the couch petting their little dog. (Can’t blame Genesis there, NYC audiences can be rather tough sometimes). "In the end, the body is not the person—the body is not the thing. It's the mind that matters."